Total effective area: not yet defined, but not more than 9.700 m2 in total. 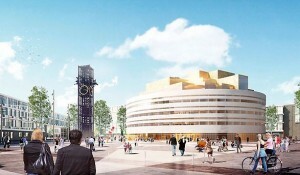 The project to build a new Town Hall in Kiruna is part of a comprehensive city transformation due to extended mining. The process of deciding where the new Kiruna will be built and developing urban land-use planning is ongoing. A sustainable transportation concept is under development. This makes that no information are available so far on how the Town Hall will be connected in terms of public transport etc. In 2004, the governmentally owned mining company LKAB sent a letter to Kiruna municipality asking for changes in the land-use plan due to the effects the expansion of their mining activity would have on the ground underneath the city. Since then, the City of Kiruna is together with LKAB working on making the city transformation happen. The Town Hall is one of the first buildings which will be replaced. Responsibility for this project is split between the City and LKAB depending on which phase is happing. The City of Kiruna is responsible for the architecture competition, while LKAB will be the builder. After this, the building will be owned by the City. Nenet, Norrbotten Energy Agency, is owned by all municipalities in Norrbotten County, thus also by the City of Kiruna. Based on consultancy of Nenet’s MountEE project staff, environmental and energy criteria were developed as an important part of the competition. Different variants in respect to energy efficiency, ecological use of material had been already discusses in the MountEE regional committee, results have been used for designing the competition. The architecture competition demands that lifecycle costs have to be accounted, but defines no specific method. Ecological optimization of materials during planning and tendering will follow the Swedish Green Building Council regulation, and all materials will be checked against a national database on ecological building materials. Results will be documented, no methodology defined yet. The completion defines clear goals and even methodology according to Swedish Green Building Council. However, as there is no decision yet on a concrete proposal, there are no concrete space allocation plans and similar yet, nor is there a final definition of the working structure. It will be part of the further consultancy within MountEE project to ensure a proper realization of plans to reach the defined energy targets. As the project is still in a planning phase with a variety of proposals no final decision on information of users yet. – Optimization of planning, tendering, monitoring offers, LCC etc. How the Service Package in general can be transferred to Sweden is part of the ongoing MountEE work and still under investigation. The application of the method to the actual pilot building will be updated according to the general Swedish approach. – Details on realization depend on which proposal will be chosen. – Renewable energies: >50% bioenergy and less than >25% fossile or nuclear energy. Connection to the municipal district heating is possible, but if this will be the case is not decided yet. Other use of renewable energy depends on which proposal is winning, not decided yet beyond energy targets see above. The City of Kiruna is aiming at realizing a truly sustainable building. This includes all dimensions of sustainability, and the already mentioned criteria are part of the architecture competition, but none proposal is chosen yet. Therefore, no more details are available. 8) Documenting building process in terms of sustainable building and publishing results. According to the joint evaluation guidelines and using interviews with the involved parties in the Kiruna Town Hall project as well as the continuous discussion of the project by the RCC.